But besides trashing the Marlboros, a change of diet may also improve respiratory health, suggests research at the Lovelace Respiratory Research Institute in Albuquerque, New Mexico. A Lovelace study published in Cancer Research in January indicates a correlation between certain dietary factors and methylation—changes in the structure of DNA that, according to Jacob Kagan of the National Cancer Institute, are “a known mechanism in the development of cancer from cigarette smoke carcinogens.” Higher levels of methylation essentially stop certain genetic functions, some of which suppress the growth of tumors and repair DNA. Without these functions, the risk of cancer grows. Since methylation is an early step in the progression towards lung cancer, identifying ways to slow down or even stop the process could be a major breakthrough in cancer prevention. For Dr. Steven Belinskey, director of the lung cancer program at the Lovelace Institute and lead researcher on this study, “The question becomes, can dietary changes prolong or prevent that process from happening?” Researchers at the Lovelace Institute analyzed cells from 1,101 participants, each of which had been a smoker for at least fifteen years, and compared the samples, considering 21 different dietary variables. 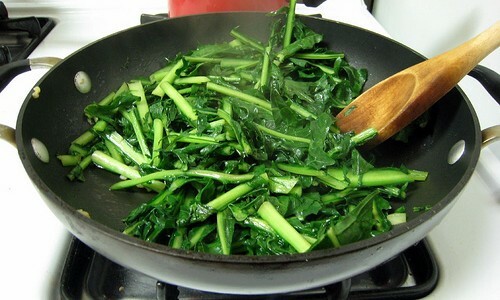 They found that participants with diets rich in leafy green vegetables—key sources of vitamins A, C, K and folate—showed a lower rate of methylation, as did those who took a daily multivitamin. Though the study suggests that consuming leafy greens like broccoli and taking multivitamins may effect the progression of pre-cancerous gene mutations, establishing a direct correlation will take more research. “We don’t completely understand the progression in former smokers, [but] this could potentially help them,” Dr. Belinskey says. Though the findings are still preliminary, some former smokers are already taking the news to heart. James O’Connor took up smoking when he joined the army at eighteen. As with a lot of smokers, it started socially. “It was just something a lot of the other guys did, and the smokers would get together and hang out in the field together,” he says. Worried about his health, O’Connor finally kicked the habit last summer after more than fifteen years. “Besides not having the energy and stamina I used to, the idea of getting cancer was something that didn't seem worth the long term use of cigarettes,” he says. After quitting, O’Connor heard about the Lovelace study and decided to take proactive steps to reduce his lung cancer risk. While he knows the damage he did to his lungs as a 15-year smoker can’t be reversed, he has decided to eat more vegetables and take multivitamins. “As I get older, other health care risks pop up,” he says. “Taking a multivitamin in the morning is easy.” The next step in the Lovelace research is a larger study wherein smokers and former smokers with unhealthy diets will be asked to change their eating habits. Depending on the outcome, “We could make a stronger statement as to what type of intervention you would want to see people take,” says Dr. Belinskey. Regardless of the follow-up study’s conclusion, James plans to continue eating healthfully. “It just makes sense,” he says.